The Echinoblog: Echinoblog Sneak Peek of the Hyperbolic Crochet Reef! Echinoblog Sneak Peek of the Hyperbolic Crochet Reef! 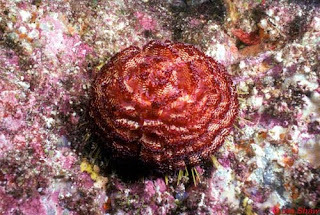 Detail of an island from the Latvian Reef, with coral by Dagnija Griezne. Photo by the IFF. 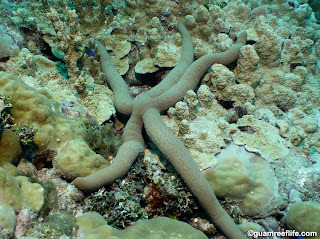 From the Hyperoblic Reef Website. One of the great things about being "the starfish guy" is that people come to you with starfish questions that they don't think anyone else can answer. For the last two weeks, I've been getting some really NEW kinds of questions! Not a hard question... I do this for a living, after all... But then they dropped THIS in front of me! 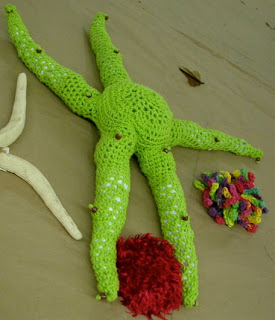 A crocheted tropical reef starfish! What could it be?? And why was it made? It turns out that in October, the NMNH will be hosting a satellite "reef" of the Hyperbolic Crochet Coral Reef Project!!! 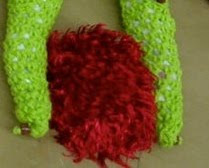 I have demonstrated my love of knit and crocheted echinoderms before (go here to see)! And am looking forward to seeing this! Especially since I'm seeing what kinds of things are going into it. 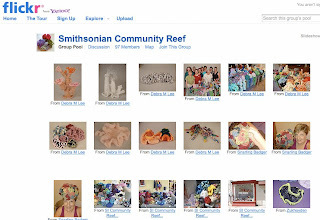 Here is the NMNH Crochet Coral Reef Flickr photostream! There's a detailed background of the whole basis and etc. of the project here but basically, its an international exhibition of crocheted coral reef faunas...the corals themselves as well as affiliated organisms-mostly invertebrates using hyperbolic crochet. The Project/Exhibition is WORLDWIDE and "satellite" Hyperbolic reefs are on exhibit in Australia, Europe, Africa and eight major cities in the United States!! The Hyperbolic Crochet Reef will be here in DC at the Smithsonian's National Museum of Natural History from October 16th to April 24th. Click here to see more! An assemblage of different types.. Here is a crocheted Ophiothrix spp. 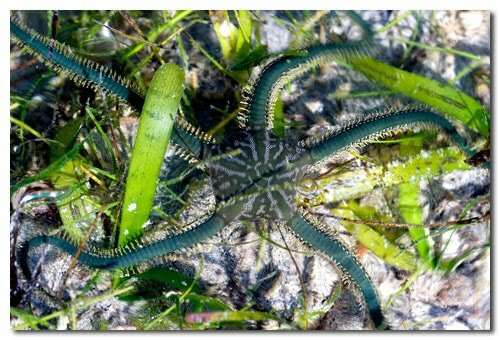 These are ubiquitous throughout the tropical Indo-Pacific and Atlantic and are readily recognizable by the large number of sharp, needle-like spines that adorn the arms. They frequently are observed living among reefs and other colonial cnidarians. 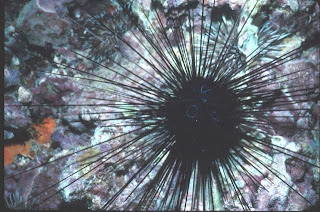 Here is a diadematid, but probably the long-spined black sea urchin Diadema. One of many urchins which are important herbivores feeding on algae while protected by its long-sharp spines. 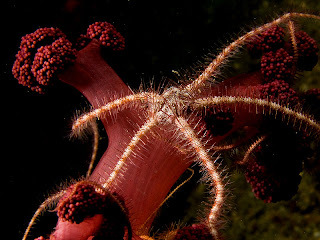 This next one is near and dear to my heart and has become a beloved echinoblog feature! The Giant Green Fish-eating ophiuroid-Ophiarachna incrassata!!! Which you can go here to see the full story! Some fun, fuzzy crocheted Fire Urchins (Asthenosoma spp.)!! and here to round out the hyperbolic reef sneak peek are some actual CORAL type things!